Parents who drive their children to school in huge 4x4 vehicles have been branded "idiots" by London's mayor Ken Livingstone. "When you see someone trying to manoeuvre it round the school gates, you have to think, you are a complete idiot," he said in a GMTV interview. Such cars had no place in the city and were largely a status symbol for people with too much money, he added. The Labour mayoral candidate described the vehicles as "totally unnecessary". But Mr Livingstone did not suggest there was no place for such vehicles. "When I see a farmer, going over rugged terrain in their four-wheel drive, I think that's a reasonable decision to have been made." "These are not cars which people should be using in London," he added. He suggested the money would be better spent on a holiday, in the interview broadcast on GMTV Sunday. Mr Livingstone is not the first politician to vent his fury against the increasing popularity of Jeep-type vehicles and Sports Utility Vehicles. Liberal Democrat MP Norman Bakers called for a raft of new laws to control the sale and use of 4x4s. Like Mr Livingstone, he also wanted to see them banned from the school run. Mr Baker also argued people owning such vehicles which produce more emissions should pay a higher rate of car tax. Conservative MP Robert Walter meanwhile called for a ban of off-road vehicles on public footpaths in order to preserve the quietness of the countryside. What do you think of Ken's comments about 4x4 drivers? Does he have a point or is it none of his business? Of course he's right. They are a nuisance in car parks and the drivers feel so safe and secure in their armour plate, that they very quickly become aggressive and think every one else should give way to them. I have a 4x4 and use it for a number of uses as well as taking my kids to school. 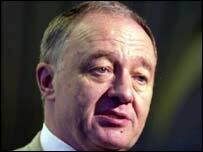 I think Ken Livingstone should shut up and get on with the job he is being paid to do. Well done Ken, I totally agree that unnecessarily large vehicles should carry a punitive level of taxation to reflect the damage they do to the environment in terms of pollution and congestion. Freedom of choice is fine for those with the money to excercise it, but as asthma rates continue to rise in children in London, the time has come to intervene. I have to agree with Ken. Although it is everyone's right to spend their money on what they want to, there is something hugely ridiculous about a giant 4 x 4 hurtling along the roads of the cities and suburbs. But worse than that is the arrogance that seems to stem from a 'my car's bigger than your car' attitude. I couldn't agree more - my road is crammed full of them. Ken will certainly get my vote now! What a load of Big Brother-ish garbage! Just about everyone and his dog owns a 4 x 4 (SUV)here in the States, and a lot of our roads through towns are narrow, but there doesn't appear to be any problems. What difference is there in the size of the average 4 x 4 to the larger "family cars"? Just for once (!) I totally agree with Ken. These huge vehicles take up more than their fair share of road-space, and one might just as well follow a furniture van from the viewing aspect. I have long held the belief that people who drive huge cars should pay more tax. That's crazy! It's none of his business, in my opinion. I live in rural montana (half a world from you :) ) and I drive my 4wd Hyundai Santa Fe everywhere as it's my only car. There are lots of places I NEED it - deep snow on untravelled, unploughed roads in the winter, bumpy dirt roads with steep hills (such as the road to my uncle's house), etc. But when I want to drive my car in the city that's my right. And it's a Hyundai - hardly a status symbol. More and more, Britain is governed at every level by control freaks. We used to say, with pride, its a free country. In a free country, I can choose my own car. Absolutely right. Owners are apparently too arrogant to realise that these great hulks of metal obscure visibility for anyone next to them at junctions and also that they hide some obstacles - like small children, for example. Get them off the road - the 4x4s, obviously, not the children! Judging by Ken Livingstone's arrogant remarks, he seems quite hellbent on making the individuals who can afford these vehicles types, look like they are commiting a type of crime. Perhaps the people who drive these vehicles want a safer ride for their children. If that seems so bad, why doesn't he lobby for a government subsidized transportation system for these children to get to school? What absolute rubbish! 4x4s take no more road space or parking space than any other vehicle and owners of larger-engined cars already pay more tax via petrol consumption, road tax, company car scales etc. It is not up to Mr Livingstone or anyone else to tell others what they can and can't spend their money on. The 4X4 sector has one of the highest percentage of LPG converted vehicles on UK roads, giving just about zero emissions and cheap fuel. Stick that in your congestion charge and smoke it, Ken! To the Americans replying to this, we have a very different rurual and urban landscape here so there is little point in drawing comparisons.To those saying we should have the "freedom" to drive what we like, have you heard of something called "responsibility"?Well done Ken.